This one-socket tower server is powerful and expandable. As your business grows, you can expand the Dell PowerEdge T330 along with it. There is no shortage of ways to expand the tower with its 16 (2.5-inch) hot-swap drive bays and up to 96GB RAM capacity. There are a number of things it can be fitted with, including a GPU accelerator, remote management options, an embedded hypervisor, and more. Operational efficiency can be maximized with redundant power supplies and hot-plug hard drives. Dell OpenManagement systems management solutions are recommended as they can be deployed quickly and smoothly. Monitor system behavior and health with an intuitive, user-friendly OpenManage console. The cheapest configuration of this chassis consists of four 3.5-inch hot plug hard drives and embedded SATA. It’s recommended that you opt for at least eight 3.5-inch drives, which doesn’t cost much more at all. The base option for the processor is an Intel Celeron G3900 CPU with 2M cache and two-cores (51-W). It is not available with turbo technology. The Intel Xeon E3 (v5 or v6) is a much better option for a processor since you will get a lot more power, speed and performance. As mentioned above, you can get tons of memory with the Dell PowerEdge T330, in increments of 4GB, 8GB, or 16GB. With enhanced DDR4 memory, you can expect a 50% faster clock speed than that of the previous generation. In addition to several HDD and SSD storage solutions, there is an internal DVD +/- drive. The PERC9 RAID controller provides superior IOPS performance. There is no need to worry about how you are going to connect with peripherals. With eight external USB ports, there is a place for everything: a printer, smartphone, mouse, keyboard, external speakers, monitor, and more. It’s easy to access the internal components of the chassis so that you can swap or add some new hardware whenever the need to do so arises. The Dell PowerEdge T330 is a cool, quiet machine that uses lower levels of heat generation and power consumption. Even when doing demanding tasks, you can trust it to stay at a comfortable watt level. Save IT administration time by automating all of the essential firmware updates, simply by using Repository Manager auto-updating. The great thing about Dell servers is that they are more than just the hardware – they include access to the best IT solutions, technologies, and management plans. 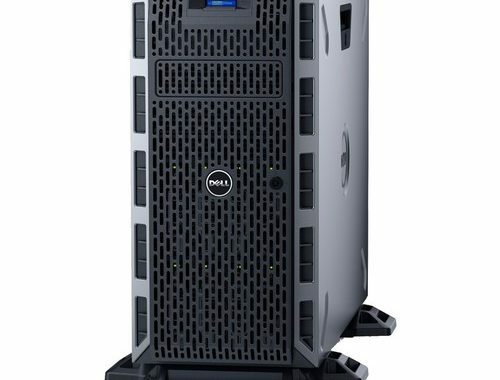 You can easily develop data center solutions with the Dell PowerEdge T330 to help you advance the goals of your small business or organization. A powerful server like this doesn’t have to be a big investment. Dell promo codes make it easy for small businesses to afford the best hardware and solutions. To get a good deal, just use Dell PowerEdge T330 discounts. Posted in Dell Desktop Reviews, Dell PC Reviews, Desktop Reviews and tagged dell, dell desktop, desktop.